Bob the shire horse out for a ride with carter Peter Hearn in 1991. I read with sadness this week the news that Bucknall Park is being plagued by anti-social behaviour. The problem is so bad that residents are banding together to form an action group to restore the attraction to something like its former glory. One of the Potteries’ smaller green oases, it doesn’t boast the grand architecture or landscaping of the likes of Burslem Park. But that doesn’t mean, of course, that it is any less important to those living nearby. What Bucknall Park did have when I was growing up was Finney Gardens which later became the City Farm attraction. The City Farm closed on Sunday, March 6, 2011 due to city council cutbacks. Over the years it had grown to become a popular and much-loved facility which attracted around 90,000 visitors each year. It boasted a sensory garden and the farm itself was home to a large range of animals – from llamas, sheep, goats, cows, ducks, chipmunks and chickens, to rabbits, ferrets and rare KuneKune pigs. There were also aviaries containing finches and cockatiels. The history of the City Farm can be traced back to 1972 when a former police building adjacent to Bucknall Park became vacant. Thanks to the vision and hard work of George Baker and his team from the Stoke-on-Trent City Parks Department derelict land and old buildings at Finney Gardens were tidied up and made safe. A lady then rang to ask whether or not a suitable home could be found to house a pair of peacocks. They became the first residents at Finney Gardens and were soon followed by a goat with no horns called William, an abandoned donkey called Jenny, and some ducks, geese, budgies and cockatiels. The Pets’ Corner, as it was then known, was born. The Sentinel’s paper archives reveal that by 1975 councillors were considering plans to expand the attraction by erecting fencing to keep grazing animals safe. 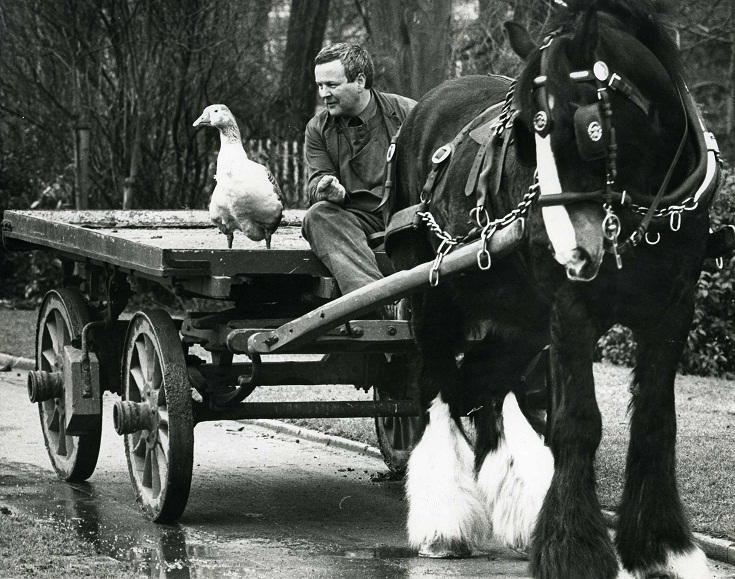 In 1978 one of the most popular attractions – Bob the shire horse – joined the fold. For the next 17 years gave pleasure to generations of youngsters by giving them rides around the attraction – ably assisted by Turk the white shire horse. As our nan and grandad lived in Bentilee, my brother and I were among them. When Bob had to be put down in August 1995 children left flowers, letters and pictures at Bob’s empty horse box. By the beginning of the 1980s, thanks in no small part to Bob’s arrival, Finney Gardens’ Pets’ Corner was a well established favourite with families – with the nearby pub on Bucknall Road an added incentive for mums, dads and grandparents like mine. A miniature railway was added which came into its own on hot summer days and when Santa Claus visited the attraction. During its hey-day, Finney Gardens was home to dwarf goats, pot-bellied pigs and even a retired racehorse and plenty of animals were born there – including, in April 1985, a Shetland Pony foal to proud mum Minnie. Sadly, Pets’ Corner is no more but perhaps a little of George Baker’s magic will rub off on families living near to Bucknall Park and they can reclaim this little jewel for future generations. I wish them all the best.